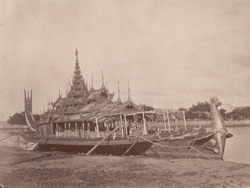 Photograph of a Burmese State Barge, taken by an unknown photographer in the 1880s. State barges were magnificent gilded vessels used by kings, courtiers and high officials in spectacular ceremonial processions and water festivals, such as the one at Ava described by V.C. Scott O’Connor in 1907: “Another of the great spectacles of Ava was the Water Festival held upon the river at the turn of the year, when its waters began to fall. To this the King and Queen came in the royal barge, a magnificent object with a spire thirty feet high, and overlaid with gold. The princes and courtiers similarly came in golden boats, and upon the river for three days the war-boats of the King, and the boats of nobles and courtiers, raced each other, to the lively songs of the rowers. The very oars of the royal boats were gilded, and as the boats circled the spray flew from their blades, and the sun blazed upon their magnificence. On the evening of the third day the festival ended to the sound of cannon, as the royal barge moved in procession through the assembled boats.” The design of the barge reflects its royal purpose, as the canopy consists of an ornately-carved tiered roof with a spire known as a pyat-that denoting sacred royal or religious space, and the prow figurehead is a mythical winged creature. It is probable that this image was taken at Mandalay rather than Sagaing as described in the title.Mandalay was Burma's last great royal capital, and consisted of a square walled city surrounded by a 70 metre-wide moat on which the royal barges were moored and processions took place.